Importantly, Malone knows how to win. 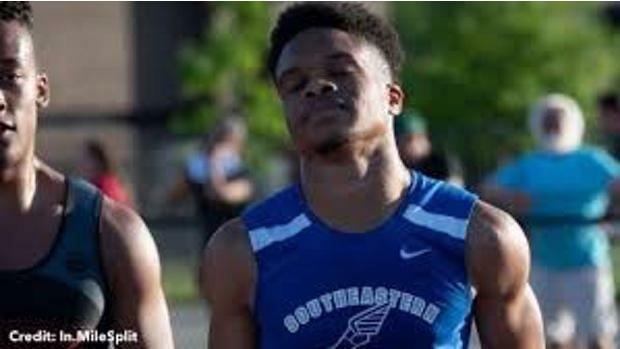 Over the past two seasons, he's become the top sprinter on Hamilton Southeastern's high school team, earning school records in the 100m and 200m, and he's earned big wins at sectional and invitational meets. 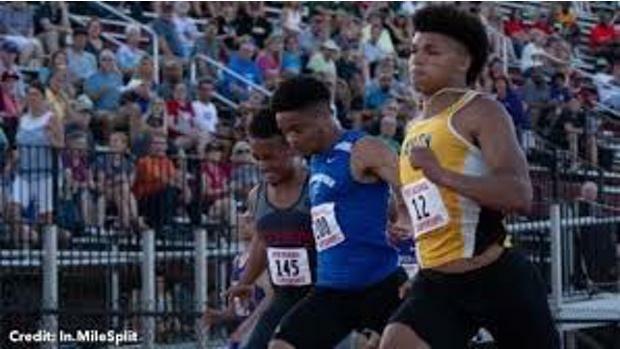 Now he heads into the AAU Junior Olympic Games from July 27-August 4 in Des Moines, Iowa, with a chance to earn medals in the 17-18 year-old boys division of the 100m, 200m, and 4x100 relay. "My goal this year would just be to place," said Malone, who's about 5-foot-10 and 150 pounds. "This is my first year in this class, and my goal is to PR." There's a good chance he can do that. Malone is coming off a sophomore season in Indiana where he hit PRs of 10.70 (+0.4) in the 100m and 21.69 in the 200m. He also ran 6.96 seconds in the 60m. The future looks bright for the soon-to-be high school junior, who one day hopes to run in college and earn a place on a NCAA Division I program. He wants to break 10.6 and 21.4 by the end of the year. He may even quality to run at the 2020 Paralympics in Tokyo. "The passion and love for track comes from the idea that if you're on working on something and if you do it in a meet and improve, that's the best thing about it," he said. If you didn't know about Malone's vision problems, you wouldn't notice he had any. He operates like any other teenager. "Not a lot of people can tell," he said. "Just looking at me, just looking at what I can do, you really can't tell. I don't show it. I don't tend to make people aware." For the most part, Malone leads a normal life. There have been tough transitions since he began losing his vision and there are some things he'll likely never be able to do--like drive a car, for instance--but he's also like most teenagers. He's goofy at times, confident, curious. Academics have been harder. Homework takes more time, as do tests. He can't see small type unless his face is a few inches away from paper or screens. His specific condition is known as Leber's hereditary optic neuropathy, which is a type of vision loss that can be passed down and affects approximately 1 in 50,000 people. His sight began to wane about three years ago, which begun a process that saw those around Malone finding ways to make sure he transitioned to a new life. As he aged into high school, Malone found a way to go to Hamilton Southeastern while also taking classes at the Indiana School for the Blind and Visually Impaired. Malone isn't sure if his eyesight will ever improve, but he's hopeful. "When it comes to eye conditions, you never know," he said. In January, he and his family went to an eye doctor in Pasadena, California. He says his sight has stabilized. Running has been a constant in his life. He started running at the age of 10, first joining the Fisher's Fire Club Track team before switching over to the Indiana Storm, one of Indianapolis' top programs. He says he's raced at four USATF Youth National Meets, three USATF Junior Olympics and one AAU Junior Olympic Games. Before he even entered high school, Malone says his biggest race came in 2015 at the USATF Junior Olympics. He made the 100 meter final and ran 11.4 seconds, finishing sixth. "That tied my PR," he said. "And that felt good." While his sight waned, his drive in track and field remained. Malone had one of the best freshman seasons in Indiana high school history, earning a freshman state record in the 100m. At the time, that was his best race. He made the state championships and finished eighth in 10.83 (+0.3) seconds. His best from the season was 10.74 (-0.2) in the preliminaries. But this year Malone doubled down on his work ethic and saw even more improvement. He earned qualifiers in the 100m and 200m at state, racing to his best finish in the 100m (4th) and best time (10.70), while also earning another medal in the 200m (4th) and his best time (21.69) at that distance, too. Malone wasn't always confident he could run the 200m well. He was apprehensive about the curve. "I felt like I was holding back, not going 100 percent," he said. "I was hesitant." But recently, Malone has been studying the race. He asks his coach to film his starts at practice so that he can go home and watch them. Then he makes notes of where his head is, how high his knees are. "The next day, I would tell him what I notice," he said. Malone's coach would tell him the technical aspects he could improve on. The teenager has made huge strides in the race since. At an AAU Regional Qualifier, he ran 21.65 seconds, his fastest yet. At the AAU Junior Olympics, he has the 11th fastest time. He could race against Florida's Tyrese Cooper and Wisconsin's Elijha Johnson and Alabama's Charles Lewis. "I think that will bring out a good mindset in me," Malone said. "Racing against those guys will bring out the best times." Once he steps on to the Drake University track in a few weeks, it won't be a dream anymore. Malone can make them reality.